The fishing over the past few days has been just one or two bites a day with a few other tailing fish seen. Yesterday however the action improved late in the day with abit of a flurry, finishing with 8 bites for the day – 2 caught with 1 around 650 lbs and one around 250lbs, breaking line on one around 700lbs. The water quality is excellent with strong current to the South and South Easterly winds. Fishing #10 Ribbon Reef we caught a nice 500lber on the first day of the charter with regular angler Ray Doody and his mates Troy and Zane. The fishing prior to this with Ray, Webbo & Pino was reasonable – caught 5 for the 7 days with the largest estimated at around 700lbs and the others around the “fat rat” 300-400lb range. All great fun on the stand up. We got a bite out of a huge fish on day 3, though were unable to strike it. Our fly fishing charter with Ishi in mid September was a challenging one. We raised several fish over the 4 days, though they were difficult to tease and unfortunately came away empty handed. We’ll try again at the end of this week for Ishi. The charter proceeding this was with Justin Gan and his wife Sui. We fished Lindenbank off Cairns before fishing our way North to the Middle Ribbons, where we found fish along the edge. We caught a total of 4 marlin for the charter with several others seen and had a bite out of a 700lber that we were unable to convert. The weather was sensational and the tuna and wahoo fishing excellent. Our late September charter with first time Cairns marlin anglers Greg Soudoure and friends Keith & Tony was great. We caught 6 fish for the 4 days with one est around 800lbs. 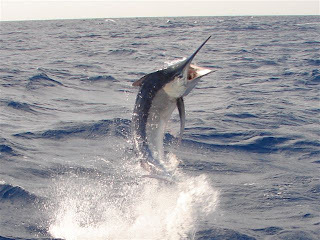 A great introduction to the Cairns marlin fishery for the boys. Above all, we really appreciated the compassion you showed the fish and the passion you hold for your industry and its longevity. We wish you all the best in the future and hope to be back on “Top Fish” sometime soon.